Make plans to join us for the next PAINT PARTY SOCIAL. This mobile painting party pops up in Houston's hot spots. This is a FUN socially stimulating and relaxing paint party. 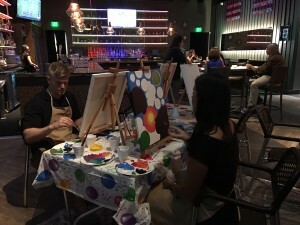 PAINT PARTY SOCIAL is a place where you can unwind and connect with other creatives and those wanting to expand their social circle. Only $35 and we'll have everything you need to just sit, sip and paint! See you there!Your lovely hostess, Maya, will put you at ease, and make sure you are all having a great time. Everyone always does! This is a fantastic ice breaker for new friends and something fun to do with friends you haven't seen in a while. Catch up with your bestie or just make new friends. #paint #party #creativitytravels Register and pay online. Plan your company or holiday party today!